Bloomberg: Legitimate News Story, or Liberal Smear? For more than a week, it has been rumored that Bloomberg Markets is preparing a hit piece on Koch Industries. Mark Tapscott of The Examiner wrote on September 19 that “[a] couple of Bloomberg reporters have been digging dirt on the Kansas brothers who own one of the world’s largest private corporations.” According to Tapscott, Bloomberg is looking into an incident several years ago in which employees at a Koch subsidiary in France were found to have made illegal payments overseas, which violates Koch policies, but is not, unfortunately, uncommon in many parts of the world. [T]he piece may also reveal at least one previously unreported controversy: Koch Industries’ connection to the sale of petroleum industry equipment in Iran in the early-to-mid 2000s. Koch currently has a policy prohibiting its subsidiaries from doing business in Iran, and the past sales (some of which likely involved state-owned Iranian companies) appear to have been conducted by a foreign subsidiary of a subsidiary of Koch. [F]irm insiders say that Bloomberg Markets Magazine is outlining an article that probes several old environmental and international controversies the company has been involved in. One of those interviewed by Bloomberg for the upcoming article said the firm received four pages of single-spaced questions, all dealing with old trade and environmental problems and issues the company says it has fixed. What is striking about the emerging outlines of the Bloomberg story is how non-newsworthy it appears to be. Employees of a Koch subsidiary in France were caught making illegal payments in 2008, and therefore were fired by the company. Is that news? Not by any normal standard. The American Bar Association Journal reported that an investigation in the 1970s found that “more than 400 companies had paid some $300 million to foreign officials, politicians and political parties. Of those companies, 117 were listed on the Fortune 500.” Foreign bribery has continued to be a problem since then. Last year, a prominent American law firm tabulated SEC and DOJ Federal Corrupt Practices Act enforcement actions. It found that from 2008–the year when Koch learned that employees of its French subsidiary had made improper payments–until mid-2010, there were 109 FCPA enforcement actions. Some companies, like Siemens, have engaged in a systematic pattern of bribery involving numerous employees and subsidiaries. Other companies, like Johnson & Johnson and Daimler, have been assessed large fines (in Daimler’s case, $185 million) for repeated violations of the FCPA. Many more companies have, like Koch, discovered isolated instances of employees making improper payments in violation of the law and of company policy, and have fired employees as a result. Most such cases never become public, but Ikea, Morgan Stanley, Dow Chemical Company and Lucent Technologies are just a few of the many companies that have fired foreign employees for making such illegal payments. So what makes a case involving a few rogue employees of a Koch subsidiary in France notable? Certainly not the manner in which Koch responded when it learned that its policies had been violated. A publicly reported French court decision recites that Koch-Glitsch Sarl (a Koch subsidiary) learned of the improper payments in April 2008, promptly conducted a thorough investigation, and terminated the employees who were involved, including the manager of Koch-Glitsch France Sarl, in December 2008. ￼Similarly, the fact that long ago, a subsidiary of a European Koch subsidiary sold equipment in Iran is anything but a bombshell. Such sales were legal at the time and are still legal today, but some years ago, Koch Industries adopted a policy that is stricter than required by American law, and now bans any Koch-related company from doing business with Iran. Companies that have done legal business with Iran include, among many others, Alcatel-Lucent, BASF, Caterpillar, ConocoPhillips, Daimler, Dresser-Rand, Exxon Mobil, General Electric, Halliburton, Hewlett-Packard, Honda, Honeywell, Ingersoll Rand, KPMG, Mazda, Mitsubishi, Nestle, Nissan, Nokia, Schlumberger, Siemens, Sony, Tyson Foods and Unilever. Some of those companies or their subsidiaries continue to do business with Iran. So why, exactly, is the fact that years ago a Koch affiliate sold goods in Iran suddenly a hot news item? Koch puts a high priority on regulatory compliance, and has a superb record of environmental stewardship. This is why the Obama administration’s Environmental Protection Agency has repeatedly praised Koch and its subsidiaries. In 2009, the EPA awarded Koch subsidiary Georgia-Pacific its SmartWay Excellence award and specifically commended Georgia-Pacific. Obama’s EPA has also praised Koch subsidiary Flint Hills Resources, calling a process that Flint Hills worked out “an excellent one” that “will serve as a model for other companies.” Remarkably, Koch companies have received more than 180 [Ed. : now more than 400] environmental, health and safety awards since the Obama administration took office. ￼￼￼We don’t know whether Bloomberg will write about that case or not. If the Bloomberg story does include the Corpus Christi matter, it will be interesting to see whether its reporters mention that last point, which tells you all you need to know: as a condition of settlement, the government extracted a promise from Koch’s employees not to sue it for malicious prosecution. Conduct all affairs lawfully and with integrity. Strive for 10,000 percent compliance, with 100 percent of employees fully complying 100 percent of the time. Ensure excellence in environmental, safety, and all other areas of compliance. Stop, think and ask. Thus, if Koch finds that an employee of a French subsidiary has violated the law, he is fired. The law permits sales to Iran, but Koch doesn’t. And the company’s environmental stewardship sets the standard for the industries in which it competes. When the official asked what the Tea Party had to do with French bribery allegations, the reporter dropped the topic. 1) News reports indicate that you are preparing a story on Koch Industries which will be published on Monday. How did Bloomberg select Koch Industries as the subject of this story? 2) Reports indicate that your story will focus on an incident in 2008 in which Koch learned that employees of a French subsidiary had made illegal payments. Why did you find this fact newsworthy? Has Bloomberg done stories on the hundreds of other American companies that have had the same experience? If not, why not? 3) Is Leon Mausen one of your sources? If so, are you aware that he was the employee primarily responsible for the illegal actions in question, for which he was fired? If so, why do you consider him a credible source? 4) Reports also indicate that your story will focus on the fact that a sub-subsidiary of Koch in Europe sold goods to Iran. Why do you find this newsworthy? Has Bloomberg done stories on the hundreds of other American companies whose subsidiaries have done business with Iran, legally? If not, why not? Do you consider it praiseworthy that Koch has gone beyond the requirements of the law by dictating that no Koch affiliate will do business with Iran? 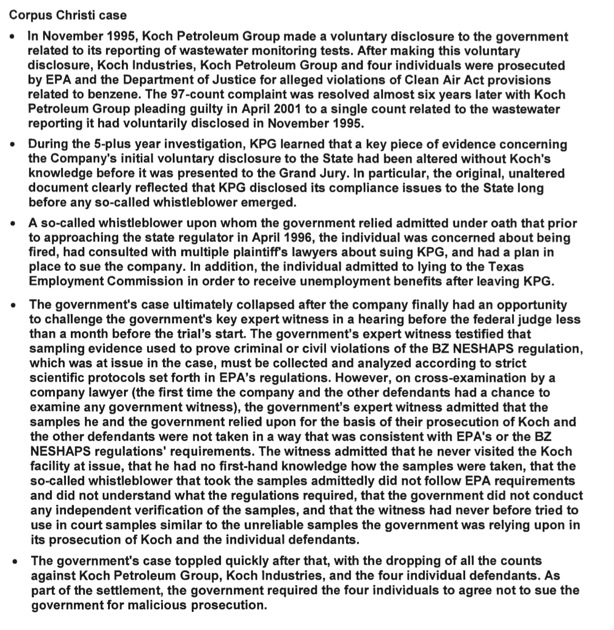 5) What research has Bloomberg done into Koch Industries’ environmental record? Are you aware that Koch and its subsidiaries have been awarded more than 400 environmental, health and safety awards since the Obama administration took office? Will Koch’s outstanding environmental record be highlighted in your story? If not, why not? 6) On September 22, a Koch representative told you that Bloomberg’s reporters have harassed Koch’s employees. In particular, that representative wrote that a European Bloomberg reporter named Elisa Martinuzzi telephoned a Koch employee at work and lied to that employee, claiming falsely that Koch had provided Ms. Martinuzzi with documents and information about that employee. Have you investigated Ms. Martinuzzi’s conduct? Has she been disciplined in any way? 7) In the same email, Koch’s representative told you that your reporter David Evans traveled to Wichita, Kansas and attempted to “ambush” a Koch employee at his home. Failing to do so, he quizzed neighbors about the Koch employee’s whereabouts and told one neighbor that he was writing a story about the employee. Have you investigated Mr. Evans’s conduct? Has he been disciplined in any way? 8 ) In seeking information from a former government official who is now a lawyer in private practice, one of your reporters made a point of the fact that the Koch brothers have supported the Tea Party movement. As you are no doubt aware, a number of negative stories about the Koch brothers and Koch Industries have appeared in liberal publications over the past year. Did Bloomberg single out Koch Industries for a negative story in order to advance a liberal agenda? If not, can you articulate any reason why Bloomberg is doing a story on what would seem to be minor, years-old events? 9) Bloomberg reportedly has provided a version of its story to ABC. Will you likewise send me the current version of your story? If not, why has Bloomberg chosen to coordinate its story with ABC? I would like to interview you over the telephone on the above topics, and will be available at any time for that purpose. Please indicate by return email what time will work best for you. Also, of course, if you wish to answer the above questions in writing, you can do so by return email. I will publish any response I receive from Mr. Neumann.